The book was designed by Ypsilon’s in-house designer Pauline Nuñez, closely following the original design. However, Nuñez used Noordzij’s typeface Ruse (which Noordzij had not). To solve a technical problem, the cover was printed in bronze and silver ink on black paper – with gorgeous result. Noordzij himself was very enthusiastic about the French edition. 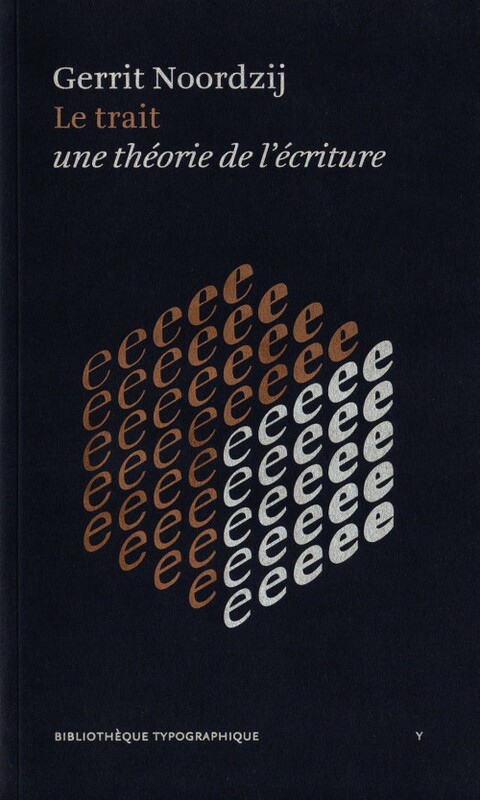 In 2010, type historian Sébastien Morlighem convinced Ypsilon, a small Paris literary publishing firm owned and managed by Italian philosopher Isabella Checcaglini, to start the Bibliothèque typographique. This became a series of publications on type design, curated by Morlighem with a little help of some friends, including yours truly. Their first publication in the new series was the French edition of Gerrit Noordzij’s De Streek. It was to be reprinted several times. The French translation Le trait already existed when Morlighem proposed to bring it out, but its translator had not lived to see it published. Noordzij’s ground-breaking, compact text had been translated from Dutch in a preceding decade by the renowned Belgian typographer and type historian Fernand Baudin (1918–2005). Baudin wrote with ease in French as well as Dutch – he contributed to a number of publications by the Amsterdam typefoundry – but wrote his major work, L’effet Gutenberg, in French. I met him only once, but had the feeling that his Dutch (or Flemish) was good, but somewhat stiff. So when Ypsilon asked me to review the translation, I was not surprised to find a few passages where Baudin had missed aspects of Noordzij’s irony or double-entendres. Nothing big, but there were some phrases that Baudin had taken literally, while Noordzij clearly meant the opposite of what he appeared to say.